Danuru (my Sherpa sidekick), fellow climber (and videographer) Ed Wardle, Sanduck (Ed's Sherpa) and I had an uneventful climb through the Icefall and Western Cwm to Camp II. Although I was "throttling back" to preserve energy for the actual summit push, I had a Personal Best time-to-camp. The final slog into upper Camp II was still pure misery, but I did it with less "internal whining" than I'd felt in the past! An early morning ascent to Camp III was planned. 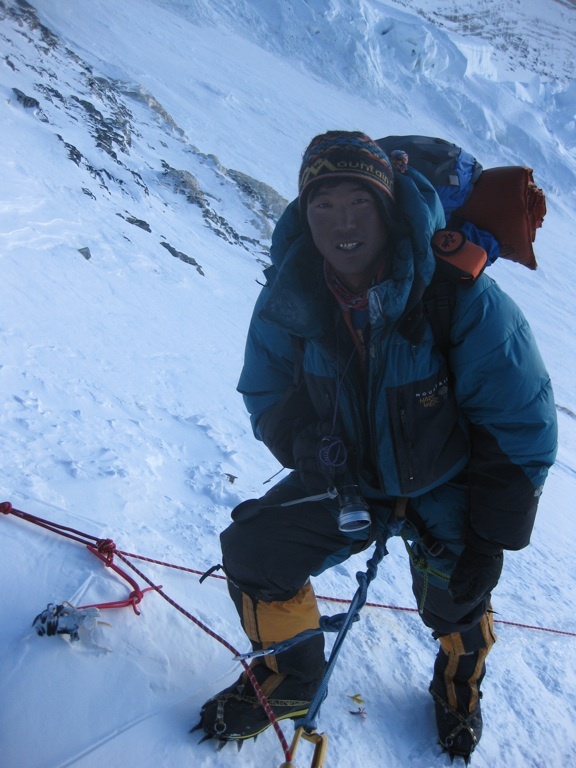 We would be wearing our full down suits, and we didn't want to get caught in direct sunlight high on the Lhotse face. Looking Down from Camp III. I am not a morning person, much preferring a warm bed and a slow transition to vertical. Everest doesn't allow for this. Instead, you quickly unzip your sleeping bag, put on your mountaineering boots (you sleep in your down suit for warmth and to get a head start) and shuffle to the dining tent, stiff from the uncomfortable night you've just shivered through. A couple of cups of Sherpa tea help wash down a pair of ultra-fried eggs, then its time to put on your harness and crampons. Steam from your breath and your teacup compete with visibility, and many others are now alongside you: three female Singaporean climbers, plus Ed, Jaime, Dawes, Chris, Mike, Louie and Paul are awake and in final preparations. The slope above Camp II starts out gently enough, and the Bergshrund (the point where the mountain separates from the glacier we were climbing) seems almost close enough to touch, judging by the string of headlamps already there at this early hour. Twenty minutes into the climb it seemed as if we were no closer, and the glacier had become dramatically steeper. Lucky O2 bottle at Camp III. I was already feeling fatigued, and the sight was discouraging. Danuru just kept marching forward, so I forced myself into breathing rhythm, matching his pace and stride once more. With this second wind, I led the fixed lines all the way up the Lhotse face in quick tempo, thankful for much better kicked-in steps than we'd had on our first trip up to Camp III. 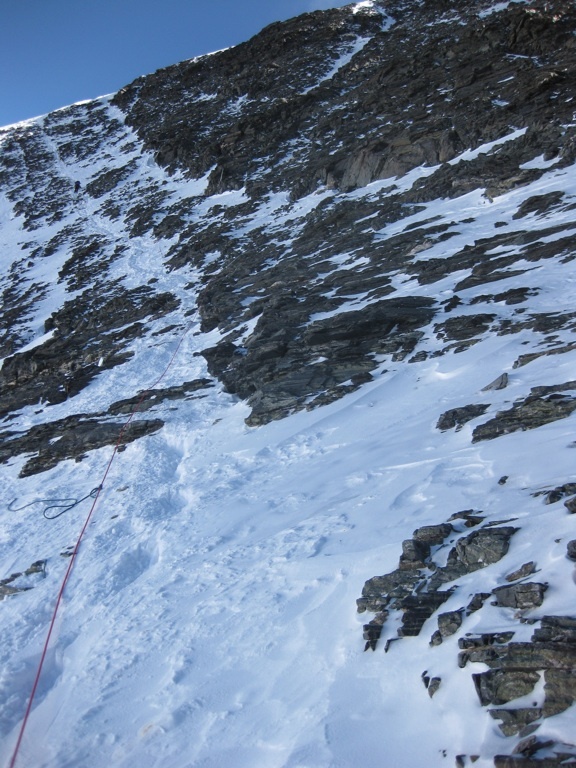 The technical traverse just below Upper Camp III had been bypassed with a much more straightforward detour --- although still very steep --- and we pulled into IMG Camp III in fine shape. Regrettably that afternoon, Paul from the UK was forced to descend for a possible medical issue. 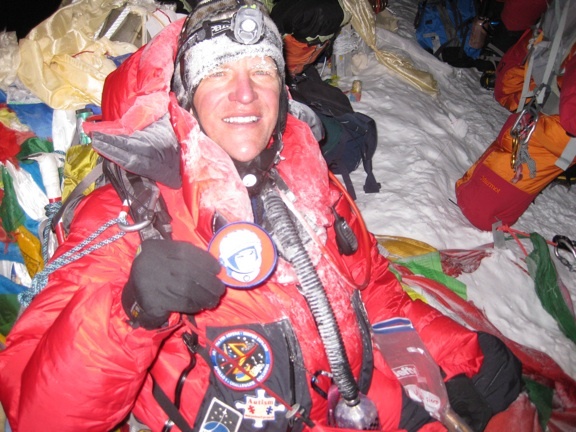 As a result his expedition was over on the 59th day --- exactly like my experience in 2008. Paul is a great guy with enormous strength and potential on this mountain, I think he plans to go back to sailing for the immediate future. Once in camp, job #1 was to eat, drink and rest. Ramen noodles, black tea with sugar and MREs were wolfed down by all. Ed and I shared an oxygen bottle (1 liter/minute between the two of us). With the sun up and warming us inside our tent, the system worked perfectly well. As the night chill fell upon us, our exhaled breath condensed within our masks, making a slobbery mess every time we turned from side to side. I eventually placed a bandanna on my chin to sop up the moisture, but even this became wet and miserable"ｦ So much for quality sleep that night! Once again, I led out on the face, and we made quick time up to the limestone feature known as the Yellow Band, the broad traverse above, and the slate of the Geneva Spur. 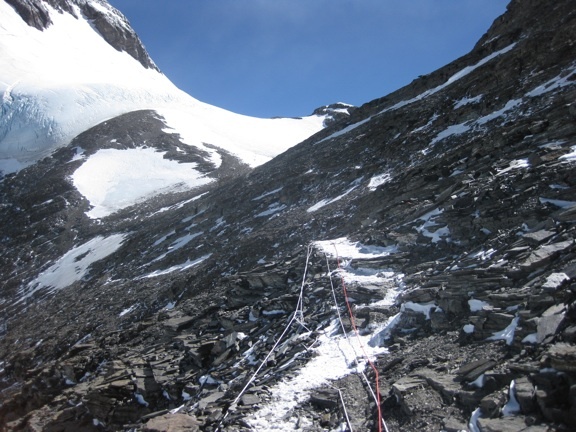 Crossing the Yellow Band and Geneva Spur entailed some brief, steep, mixed climbing (snow, rock and ice): careful crampon placement on sloping rock slabs allowed us to pass without incident. Strangely enough, the higher we got, the stronger I felt. 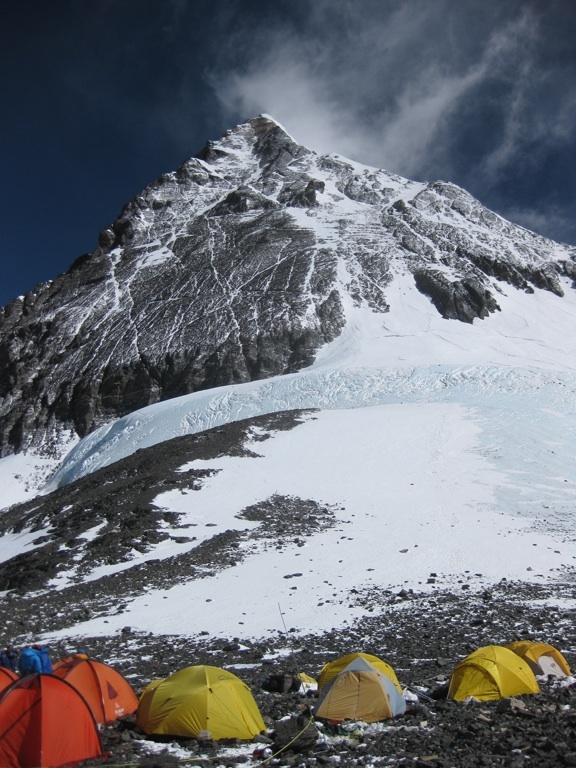 By making it to the Yellow Band, I had set a personal altitude record, and our cadence and stride had enabled us to even pass a number of Sherpas also heading to Camp IV that day. I really began to think I might actually summit this Hill! 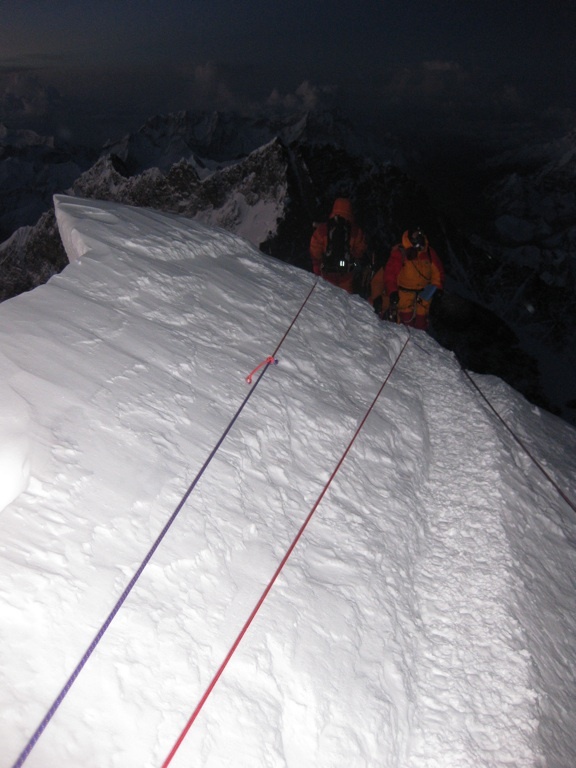 Looking down from above Lhotse Face. On top of the Geneva Spur I continued for 10 or 15 minutes along some rolling rises, briefly surmounting the 8000-meter mark --- the so-called "Death Zone! 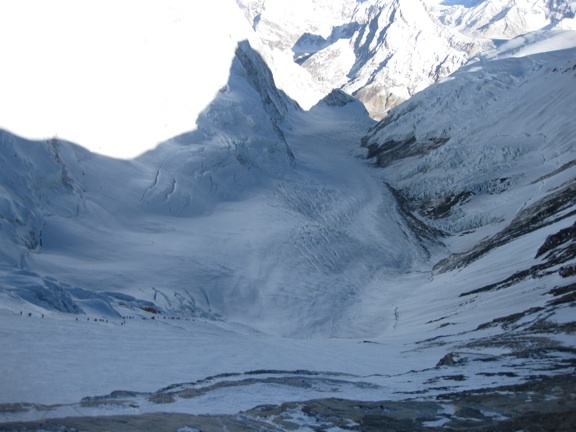 " --- and was finally treated to a full view of the Triangular Face and the Southeast Ridge. Descending slightly, I finally rounded the corner and saw the huge boulder my teammate John Golden had told me about. That meant that the South Col and Camp IV were very near! Looking down - Mess on the South Col. Feeling reasonably strong on 2 liters of oxygen a minute, I briefly explored the wasteland that is the South Col before settling in. The area is rocky and windswept, about the size of two or three football fields side-by-side. Primus fuel canisters, tent poles and random garbage from expeditions long since past were underfoot. 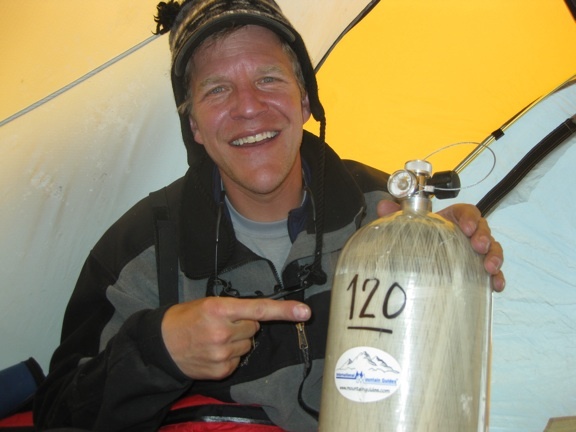 I had been led to believe that earlier environmental clean-up expeditions had brought down all the mess, but it turns out these groups primarily brought down oxygen bottles --- after all, these had commercial value! 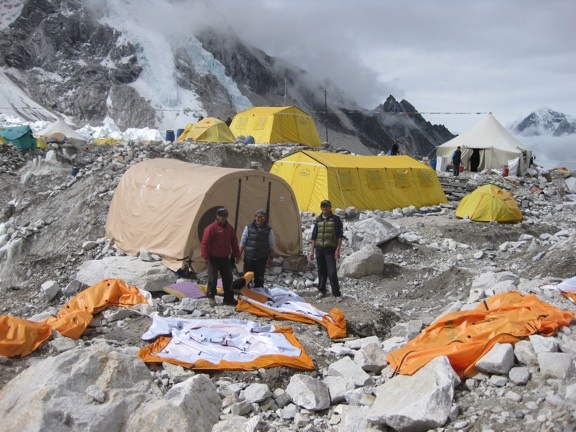 For the most part, the Nepalese side of Everest is quite clean, but Camp IV is certainly an exception. I then assembled a tripod a short distance from camp, and mounted our Gigapan camera for operations. 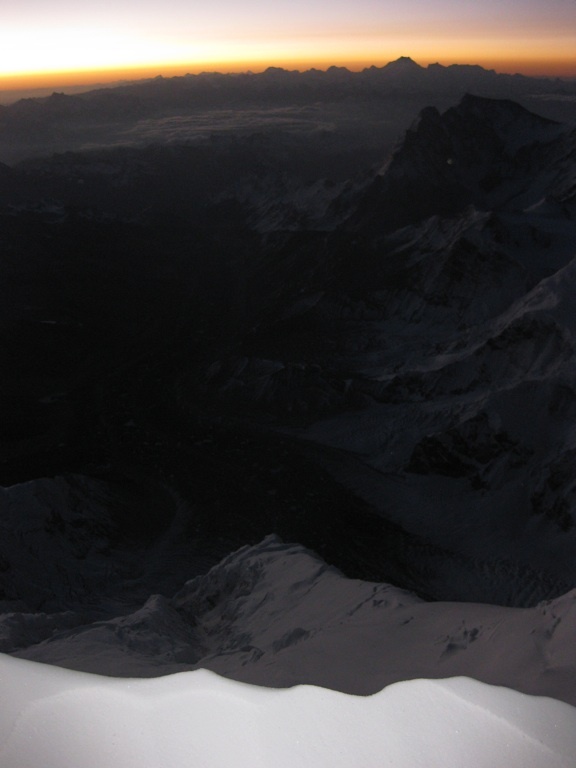 The Gigapan is a robotic camera mount we were using to acquire a 360-degree, high-resolution panorama of the South Col. The NASA-developed technology is similar to that used on Mars Landers and other robotic spacecraft. We will process the billions of pixels of imagery once we return to the US, and provide a link to this remarkable photographic scene. We are certain that it is the highest such image ever taken. As at Camp III, rest is paramount at Camp IV. Moreover, I only had a few short hours to recharge my internal battery. We would set out for the top in the early evening under headlamps, and climb through the night. Meanwhile, my tent mate Ed was busy all day and evening, trying to troubleshoot the microwave-linked "Sherpacams" and other cinematic challenges. As evening approached and a light snow began to fall, I became a bit worried that he might not have enough energy to go for the summit: I had been snacking and sipping all afternoon long, but he had been in perpetual motion. Thankfully Ed is much tougher than I am! On O's before the summit push. 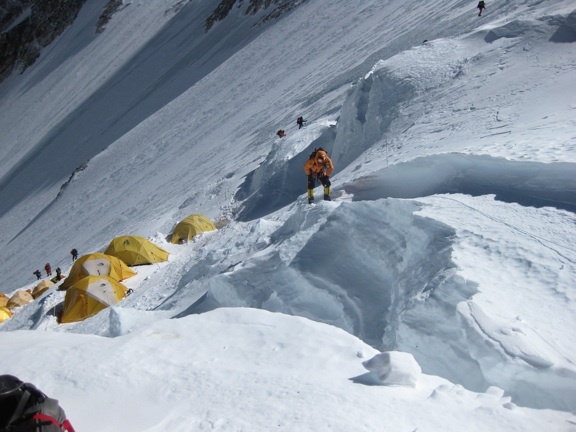 Since the publication of Jon Krakauer's book "Into Thin Air" (chronicling the 1996 tragedy atop Everest) much has changed in terms of strategy for climbing the mountain. Careful observation of weather and anticipation of storms via forecasts, earlier departures for the summit to avoid typical afternoon precipitation, fixing of the route from the Col to the summit and many other corrective actions are now commonplace amongst climbing teams. Our IMG team consisted of myself, Discovery's Ed Wardle, the three Singaporean female climbers (Li Hui, Ester and Jane), Dawes Eddy (who would become the oldest American to summit Everest at age 66), Chris Bergum (from Montana), guide Mike Hamill and Louie Carstens from South Africa. There were several other climbing groups perched at the Col, ready to summit alongside us, which caused me some consternation. With that in mind, members of our IMG group elected to depart high camp sometime between 8 and 9:30 am, depending on their anticipated pace. 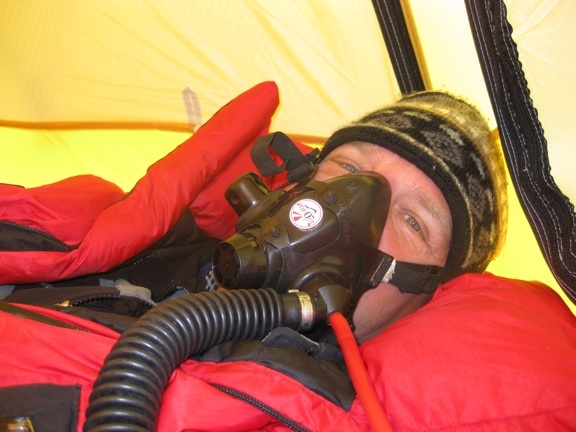 Based on past performance, I thought I'd be safe leaving closer to 9:30 am, but as the sun set and summit fever began to stir in neighboring tents, I couldn't help keeping pace: my fresh oxygen cylinder was in my backpack, my harness was on, my hot water was in the proper containers, and I was mentally prepared to depart camp at 8 pm! The Singapore team had previously been the slow-and-steady group, and per plan left just after 8:15 pm. My goal had always been to see an "orbital sunrise" from the top of the mountain --- more on this later --- which would occur sometime around 04:15 am. Quickly developing a new strategy (we call this "strategery" down where I come from*), I thought that the Singaporeans would make very good pace-setters for my new plan, and keep me ahead of the traffic jam that might develop in the hours to follow. Everest from the top of the Geneva Spur. For some spell of time, Danuru and I ended up in front of the entire pack --- IMG was the first team to depart the Col, so we were at the front of a large snake of headlamps on the Triangular Face --- but I relinquished our lead to Li Hui and Ester as quickly as I could. I knew I'd have the tendency to push myself too hard too soon and possibly fail to make the summit, and/or arrive far too early to see the orbital sunrise I sought. 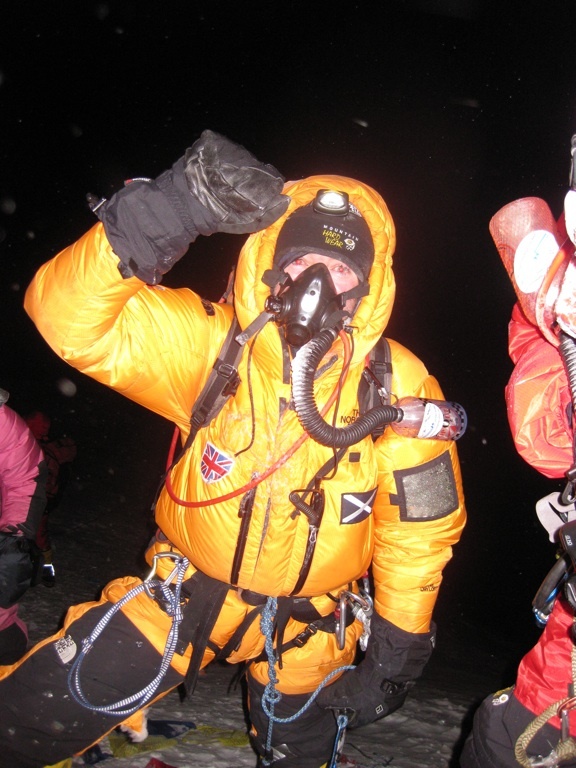 What I didn't realize at the time was the truly impressive pace Li Hui was setting for a pitch-black summit arrival! Several prior seasons worth of tattered, fixed ropes remained as we crested each tier of exposed rock. Each time I'd see these ropes I'd re-inquire: "Balcony? " "Pretty soon" became disheartening as hell, and I began to question whether I'd make it, especially when we'd hit another section of really loose snow. You see, it is very difficult to keep your breathing in check with your upward mobility when every foot is a struggle. The little voices in your head suggest you go down, but just as I'd think about crying uncle I would hit solid snow. I was again able to rest-step and breathe with regularity. I would get back in the game, and a limited confidence in the summit returned. Three and a half hours into the ascent, we arrived at the Balcony. The Balcony is a jink in the road to the top about the size of a basketball key --- enough room for a few of us to swap out oxygen tanks and then press on to the summit. Being pretty exhausted and thankful for a small ledge to sit down on, Danuru helped me swap tanks. A swig of warm water and a Gu --- Double Espresso-flavored --- was a welcome respite. Our next destination was the South Summit, and I led off with Danuru in trail. My thick mountaineering mittens could barely fit through the handle of my ascender device, but thankfully I had modified my down suit to clip the mittens onto the suit. At each anchor point --- there must have been hundreds --- I would have to remove one mitten (I had glove liners underneath), relocate my safety carabiner above the anchor, followed by my ascender. The going was very steep, and on at least two pitches below the South Summit the terrain was quite technical: upward traverses on featureless, snow-dusted slabby rock while under tension from my ascender. Occasionally, Li Hui and Ester, who were immediately in front of me on this tough terrain, would come to a halt, but generally the pace was very crisp. By the time I got to the South Summit I knew I was well ahead of schedule: it was only 2:35 am when we arrived there for a short rest. As Li Hui and Ester motored on with impressive strength, I sat on the sub-peak under a thin, crescent moon and tried to visualize the route ahead. My headlamp certainly gave no cues, and my eyes couldn't dark accommodate sufficiently to see the enormous summit I knew remained ahead of me. As Dawes and Mingma Chirring joined me on the South Summit, Danuru and I saddled up and continued along the thin ridgeline, guided by the thin fixed line stretching off in front of us. 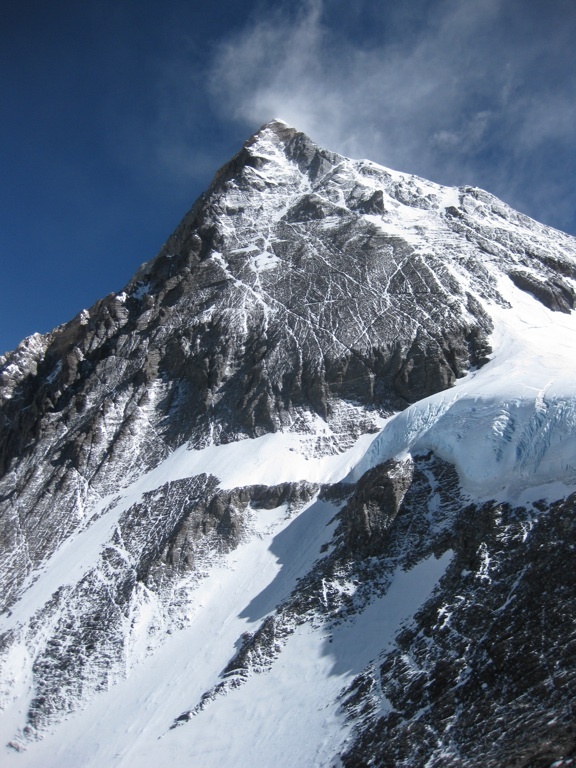 The Hillary Step is one of the most famous landmarks in all of mountaineering. The roughly 60 foot vertical pitch begins as a "dihedral," sort of like an open book that allows you to stem your legs on either side as you move upward. Covered in snow and ice at the beginning, it was straightforward for a tall guy like me to work my way up. At the top of the step, you traverse a few feet to the left and around a large block of exposed rock. Again, a fairly straightforward and unintimidating rock climbing move when simply focused on the view enabled by your headlamp. The enormous exposure descending during daylight hours was a different matter! Following the Hillary Step, the ridgeline remained exciting and challenging, and my heart raced because I knew that within minutes the summit would be mine. Topping one of several false summits, I could see Li Hui's stationary headlamp up on the summit, with Ester's almost meeting hers. Off in the distance, to the south, I could see flashes of lightning, and I briefly wondered if they had any bearing on the weather for my descent. By that point it didn't even matter, though, because I had no intention of diverting from the summit. Yuri's night patch on summit. 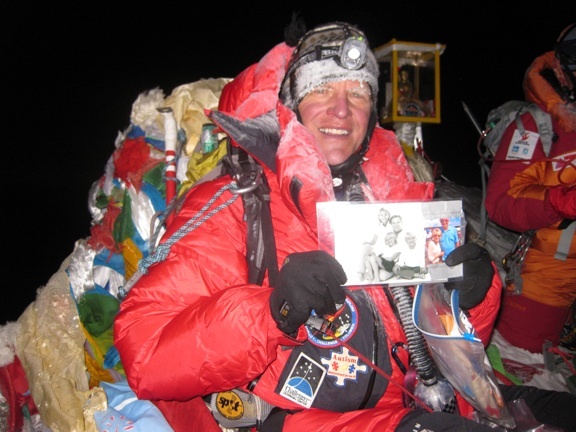 At 4:00 am local Nepal time I proudly stepped onto the summit, a dining room table-sized snow platform with rather sloping sides, and carefully sat down on a mat of wind-weathered Tibetan prayer flags. After catching my breath and giving Danuru a double fist bump, I could begin to see a faint orange glow off on the horizon. I would see my "orbital sunrise" from the summit of Everest! I reported to IMG base on my handheld radio, thanking the Sherpas in particular for all they'd done for us in the preceding weeks. Then Danuru and I got to work on my "summit bling photos", as I'd brought many things for many people and organizations (thankfully I was able to break through the ice on the front of my down jacket and get at my camera inside). Family photos, a flag from my sponsor SPOT and another from the Explorers Club were quickly displayed and stowed. I tied off a pair of flags I'd made to honor astronauts and cosmonauts who had perished in the line of duty (Apollo 1, Challenger, Columbia, Soyuz 1 and Soyuz 11), as I could think of no finer place on Earth to hang them. In the coming days, weeks, months and years, like their Tibetan prayer flag counterparts, they will weather under the wind, sun and snow, and slowly lift back up into the heavens. 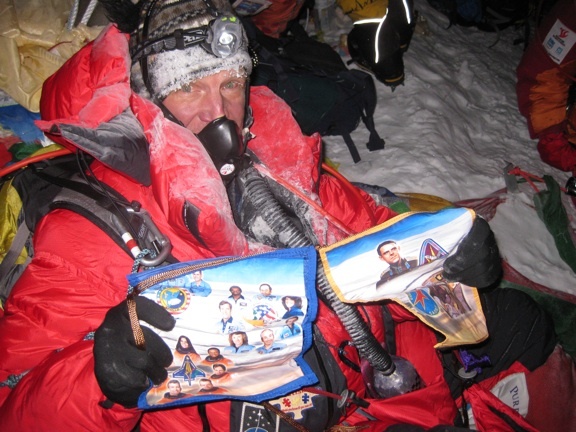 Astronaut-Cosmonauts commemorative flags on summit. Another very special item I'd requested from NASA was a piece of the Moon, to honor a pair of my boyhood heroes, Neil Armstrong and Sir Edmund Hillary. Following their legendary explorations, the two became great friends, eventually traveling to both polar regions together. To my surprise, NASA loaned us a small sample from none other than Apollo 11! Danuru thankfully was able to take a wonderful photograph of me with the lunar sample, the crescent moon visible over my head. Keith and NASA public affairs had tried to locate Neil for a brief satellite phone conversation from the summit, but ultimately the call couldn't be arranged --- and my time on the top was already running out. As the full sun rose above the horizon and the triangular shadow of the mountain was cast to the west, Danuru and I began our long descent back to the South Col.
Not to offend anyone's religious sensibilities, but while up on the summit and while following the high ridgeline above all other mountains in the world, I honestly felt as if I was getting a sneak peak at heaven --- seeing a place that humans weren't really meant to see until much later"ｦ The scale of the scene seemed to defy the laws of nature and physics. The view was both frighteningly and impossibly beautiful, and I recognized that I couldn't stop and stare and linger. I was thrilled to have had the opportunity, but it was time to go home. Full of excitement and adrenalin, I realized that each step from this point forward was one step closer to home and family, which became a huge motivator as the exhausting day drew on. Twenty hours after departing high camp we finally pulled into Camp II, as tired as I'd ever been in my life. Later in the day I would call home, shower and begin packing for the trip out. Kaji made his famous chicken sizzler that night for dinner to help us celebrate, both our summits and Tucker's birthday of indeterminate years. 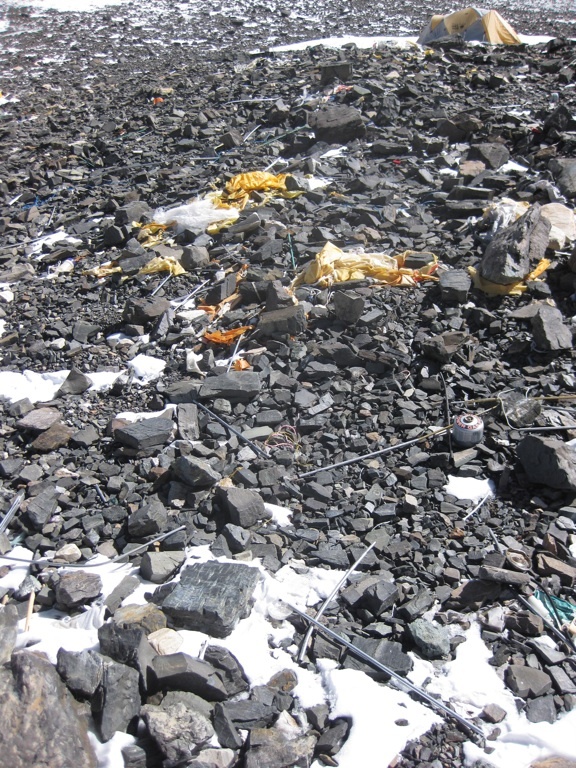 Thirty-six miles of rocky, up-and-down trails separate EBC from our airplane ride to Kathmandu. Still weary from pushing myself up high on the mountain, Keith and I both were whupped at the end of each day, but we made it to Pheriche, Namche Bazar and Lukla on three successive days. Although the days were generally overcast --- and outright rainy each afternoon --- the scenery was amazing, particularly as we got below tree level and the flowering Rhododendrons and other greenery came into view! This is the gradual reintroduction to society and spring that I missed last year by abruptly flying out in a medivac helicopter! 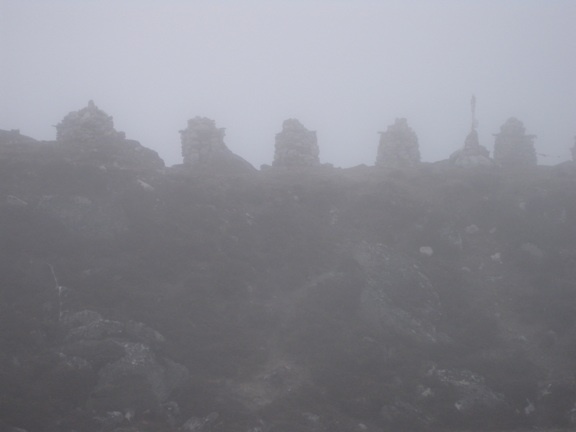 Chortens - Memorials to fallen climbers on the trek out. 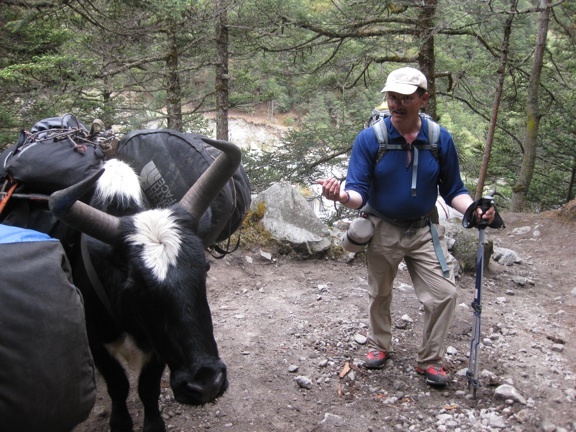 Keith trying to make peace with a yak. Last night many of our team gathered at the famous Rum Doodle Restaurant & Bar in the Thamel district of Kathmandu. Dawes and I fulfilled a longstanding tradition by signing the wall behind the bar, as have countless other Everest summiteers before us. Last year, my friend and fellow injured teammate Monty and I sipped an Everest beer here and lamented the fact that we weren't yet "worthy" to sign the wall. Chris and Louie made plans for their return to the mountain next year, when I'm confident they'll "finish the job" they started this season. Although each had to turn back a bit short of the summit this time, like me they'll have a full year to think and plan for their next assault. I know for a fact they'll be safe and successful.